Keeping multiple balls in the air is all in a day’s work for Tori Kopke. 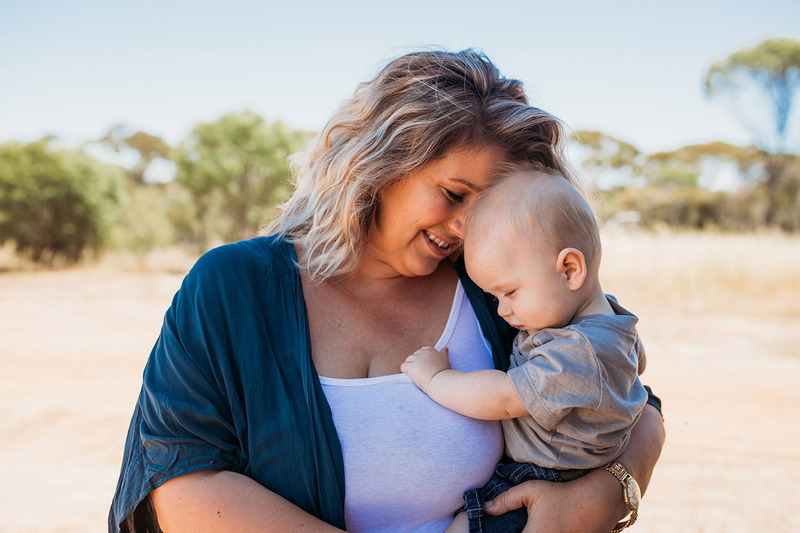 This Texan expat mama runs her own marketing business, works part-time for the WA Wheatbelt Business Network, and performs the active role of farmer’s wife. No mean feat with an eight month old in tow. So, how does she manage the juggle? By knowing her strengths and working to them. And one of those strengths, we think, is having the courage to find the right flexibility that works for her. Can you tell us a little about you and your beautiful family? My husband and I live on our family farm in the WA Wheatbelt. We’ve got a gorgeous little eight month old who is just full of personality. I had no idea I could love so much till he came along! I am originally from Texas. My husband and I met eight years ago while I was travelling. While I miss my family every day, I absolutely love my life here in Australia. But factoring in trips to America, and taking the time to FaceTime family is a very important part of my life. So, you’re a Texan living in the Wheatbelt of WA. What events led you to living there and what do you love most about it? When I left Texas to travel, I always thought I’d return! It wasn’t until halfway through my year in Australia that I met my husband and began to see that things might not go as planned. I actually booked three flights to leave and never did! I love the lifestyle. I can’t think of a better place to raise our son: getting to see his dad throughout the day, going on tractor rides, and just being part of the family farm. The beaches, the fishing and the wineries are all pretty fantastic too! You have a gorgeous eight month old boy. How has becoming a mother changed your perspective on life? I have no idea what I did with all of my time before! But in all seriousness, everything I do or say now is modelling and impacting this little human. Decisions have so much more gravity than before. The time with him is flying, so I try to be present and engaged with him at all times. I don’t want to blink and suddenly have an 18 year old! Treasuring those little moments has become a huge priority. I try to be mindful and soak it all in. Do you have extended family and friends nearby who you can call on for support? I have an amazing network of friends and family all across WA, which comes in handy as my work often sees me travelling to different parts of the state. I think as a mother though, you definitely need that handful of friends who are experiencing or have recently experienced the stage of life you are in. As a new mom returning to work, having someone that understands the mental load you are carrying is invaluable. Those friends that you can unload onto are irreplaceable. I feel lucky, having moved as an adult to a foreign country, that I have been able to form such an amazing network. But I think the biggest thing is you need to recognise you’re not Superwoman, and it’s okay to ask for help and admit you can’t do it all. Did your career change after becoming a mother? Are you more or less ambitious? I definitely have become more ambitious, but becoming a mother has made me realise how valuable my time is. If a client needs me to be away from my son, then it needs to be financially and emotionally fulfilling. Coming back from maternity leave had its challenges as a business owner, but I took the downtime to pivot and repackage my services. It turned out to be a fantastic opportunity to look at everything with fresh eyes and assess my priorities. Also, learning to say no and turn away work has been a massive lesson over the last few months. You juggle your own marketing business, work part-time and are a farmer’s wife…tell us about your career journey to date. I started my career in Australia working for a Texas based oil and gas company. It was the perfect fit for me at the time. I was headhunted by a machinery manufacturer in the Wheatbelt, which is when I made the switch to live full-time at the farm and really learn what it means to be a farmer’s wife. Two years ago, I found myself in a high-level management position but very unfulfilled. I felt there was no future for my role, no opportunity for advancement, and the walls were closing in around me. I was approached by the Wheatbelt Business Network, a nonprofit focused on connecting businesses and growing the Wheatbelt region. This flexible working position simultaneously allowed me to establish my marketing consulting business. In that early establishment phase I had to make a lot of sacrifices financially and with my time. But fast forward 18 months and those sacrifices were all worth it. The juggle sure is real! What does a crazy day look like for you and how do you stay sane? Look, I’d love to sit here and say organisation is key. But not everyone excels in an organised environment. If you are not a person that thrives on lists and scheduling—I am your girl. I am the queen of flexibility and living in a form of organised chaos. Find a system that works for you. I have a yearly calendar that works as the command centre for everyone. I also have copious amounts of A5 diaries floating around my workspace. I use them as a chronological record for everything—which is probably an incredibly ridiculous method of organisation. I have recently discovered Trello. It’s my new favourite thing. It is highly visual and has so much flexibility. I try to keep every morning the same with the little guy. Breakfast and play until about 9AM and then it’s work time. Some mornings that means client calls and website builds, and some mornings that means we’re in the car out on the farm. The flexibility and the results. When it comes to the results, you get out as much as you put in. I’m only limited by my own ambition—and that is an absolutely perfect fit for me. In terms of flexibility, my role as a farmer’s wife is pretty typical for the region: keep everyone fed and organised, then drop everything and drive to the ends of the earth to pick up parts. I need a role where I can be completely supportive for the farm, yet fully autonomous and independent for my own business needs, childcare, and general running of the household. Running my own business has given me this. Also, flexibility is essential to run a business in a regional area where we are often limited by childcare options. A regular nine to five just wouldn’t work with the childcare options I have available (over two hours a day drive to daycare), unless someone was living with us full-time (but that didn’t work for us. Tried it!). Funny, when I left Texas in 2010 I was given a sugar packet by my aunt. It said, ‘Find your strength and shout it from the rooftops’. That little packet has been in my wallet for eight and a half years—I look at it every day. I think to excel in your career, no matter what the path looks like, you’ve got to know your strengths and talk about them openly. Who do you love to surround yourself with? Strong women. I think it’s important that you see qualities you want to emulate in the people you surround yourself with. The people I am closest with are driven, whether it be women on farms, in their own careers and businesses, or just killing it at home. It takes a special kind of woman to not only survive in our rural surrounding, but thrive—and those are the ladies I want to be like. I’m also lucky enough to have a few international women as my closest friends, so they understand the juggle of not having your own family to call on when you need it most. Just thinking about them warms my heart! 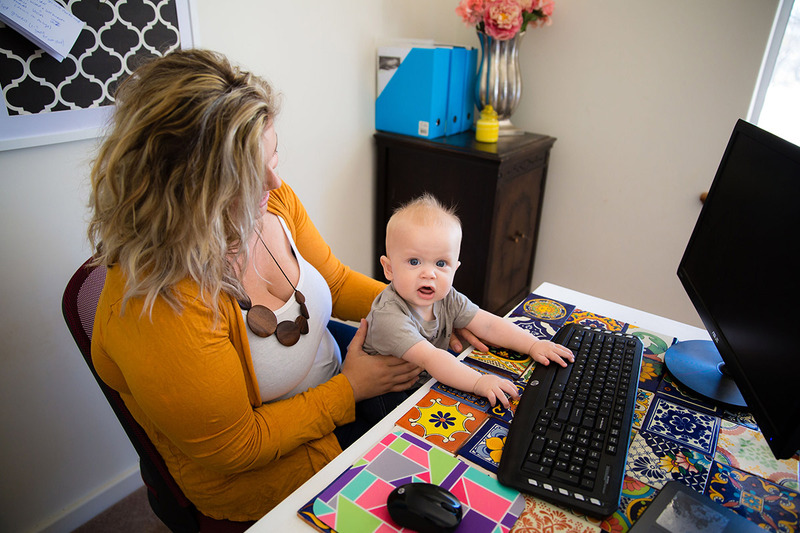 What is the biggest productivity hack for being a work at home mum? My biggest productivity hack for a work at home mum: Get up and get dressed. Every. Single. Day. Before you leave your bedroom, before that first cup of coffee, get dressed in real clothes—no yoga pants, leggings or pyjamas. You are going to be so much more productive in real clothes. Dress in something you would wear in front of clients and peers. Also, designate a space for your work. You won’t be as productive working at the kitchen table or on the couch as you will be in your designated work space. Favourite time of the day is…mornings as a family, and occasionally Skyping my family in America. Instagram sites that inspire you…@eskimo_nell; @notsoperfectmum; and @houseofwhite_—I love them. I am happiest when…I have a glass of wine, cooking dinner, watching my husband and son play. I’m addicted to…water, wine, leopard print and a good eyebrow pencil. Favourite wardrobe staple for work…my grandfather’s watch. It’s a talking point and it’s functional. Favourite wardrobe staple for weekend…clothes that look smart and feel like pyjamas. Heels or flats? Both—I love a good chunky heel or a leopard flat.